Сборникът с докладите от конференцията “EКО ВАРНА“ излиза ежегодно, като първият брой е издаден през 1995 година. Основен организатор на конференцията е катедра „Транспортна техника и технологии” при Технически университет - Варна. Съорганизатори са ТО на НТС Варна, Българска асоциация автомобили на природен газ, Български газов център, СНАТЕБ и др. Участници са научни работници от всички висши учебни заведения в България, екологични и газови организации, учени от Сърбия, Русия, Украйна, Турция, Полша и др. Rosslyn Dimyat Hotel Varna . Покана за конференцията 2019 г. може да изтеглите от тук! Abstract: The report examines the trends in the development of the internal combustion engine market in the time of growing requirements for the content of pollutant in the exhaust gases. The current EU legislation and its future modifications regulated in EURO 6d TEMP, in order to more accurately take into account the content of pollutant and CO2 is analyzed. On this basis, there are forecasts of the produced vehicles with different propulsion up to 2025.Most serious attention is paid to the place of electric cars in the future market. They are considered not only towards their positive sides - low pollution of the environment and low energy costs. Several of their disadvantages and potential negative consequences from their mass production are pointed out. An analysis of the automotive market in Bulgaria and the environmental problems, which follow from its structure and age is made. Abstract: The lowering of carbon dioxide emission is world pursuit which is written in international agreement. It concerns all economy sections, especially motorization. In this last case the lowering is essential, since almost all fuel used for powering vehicles comes from non-renewable resources. Using these fuels means a one-way carbon motion from underground lode to earth atmosphere. This process has to be immediately stopped. For several years there have been taken actions in this direction. There are both legislative and technical actions. However, the reports which were published in 2016 shows that despite the efforts and engagement of considerable means, the effects are mediocre. There has been noticed, that, though the lowering of carbon dioxide emission determined in bench tests has been attained, it is impossible to notice this progress in natural operation of vehicles. The causes of such a state are sought mainly in incompatibility of test conditions to the real operation of vehicles conditions. Assuming that the carbon dioxide emission is (quasi) directly proportional to fuel consumption, in the article there has been proposed the method of solving the problem of removing divergence between test and operational data. There has been suggested the different attitude to bench data analysis and implementation of new calculative procedures in a way to reach the correlation between the test and operating fuel consumption. 3. Sitnik L. J.; Theory of cumulative fuel consumption by LPG powered cars.Journal of KONES. 2015, vol. 22, nr 4, s. 275-280. 4. Dimitrov R., Magdziak-Tokłowicz M., Sitnik L. J., Reksa M., Tkaczyk M., Wróbel R.; A comparison of fuel consumption between the new european driving cycle test and the natural operation of a vehicle. MTM Machines, Technologies, Materials. 2014, vol. 8, nr 2, s. 23-25.v 5.Sitnik L., J.; Theory of cumulative fuel consumption and example for its application. 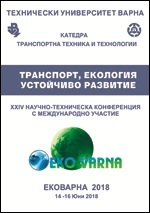 Trans & MOTAUTO' 14 : XXII international scientific-technical conference : proceedings, Varna, Bulgaria, 23-24.06.2014. Section I, Vehicle engines. Application of fuels types. Efficiency. [Sofia] : Scientific-technical union of mechanical engineering, 2014. s. 17-20. 6. Sitnik L. J., Magdziak-Tokłowicz M., Walkowiak W. W., Wróbel R. S.; Włostowski R. M.; Comparison of mileage fuel consumption with the natural operation of the three different cycles. Journal of KONES. 2014, vol. 21, nr 4, s. 439-444. 7. Sitnik L. J.; Teoria skumulowanego zużycia paliwa i jej aplikacja. Transport Przemysłowy i Maszyny Robocze. 2014, nr 2, suppl., s. 116-121. 8. Skrętowicz M. D., Sitnik L. J., Kaźmierczak A., Magdziak-Tokłowicz M.; Evaluation methods of the impact of motorization on the quality of the atmospheric air. Journal of KONES. 2014, vol. 21, nr 4, s. 445-452. 9. Kardasz P. Ł. Sitnik L. J., Szuberski K. Haller P.; Ekologiczne skutki motoryzacji. Autonaprawa. 2010, nr 9, s. 22-24. 10. Sitnik L. J.; Some aspect of theory of cumulated fuel consumption. Journal of KONES. 2010, vol. 17, nr 4, s. 447-453. 11. Sitnik L. J.; Analiza przebiegów do wymiany oleju silnikowego w eksploatacji naturalnej samochodów. Journal of KONES. 2009, vol. 16, nr 3, s. 367-373. 12. Sitnik Lech. Statystyczna weryfikacja osiągów silników spalinowych. Journal of KONES. 2006, vol. 13, nr 4, s. 175-182. 13. Sitnik L. J.; Skumulowane zużycie paliwa. Archiwum Motoryzacji. 2004, vol. 7, nr 3, s. 227-254. 1. Guo H., Murakami H., Kuroda S., Thermal cycling behavior of plasma sprayed segmented thermal barrier coatings. Materials Transactions, 47 (2), 2006,306–309. 2. Hu Z., Ladommatos N., Reduction of unburnt hydrocarbon emissions from spark ignition engines using in-cylinder catalysts. Proc Instn Meeh Engrs, Part D: Journal of Automobile Engineering, 210, 1996. 3. Nedunchezchian N., Dhandapani S., Effects of in-cylinder catalytic coating on the performance of a two-stroke spark ignition engine. Indian Journal of Engineering & Materials Sciences, 8, 2001, 1–7. 4. Neonila Levintant-Zayonts, Rozprawa doktorska: Wpływ implantacji jonowej na własności materiałów z pamięcią kształtu typu niti. 5. Normand B., Fervel V., Coddet C., Nikitine V., Tribological properties of plasma sprayed alumina–titania coatings: role and control of the microstructure. Surface and Coatings Technology, 123, 2000, 278–287. Abstract: The results of the power plant features experimental studies based on reciprocating engine 1 cylinder 4- stroke engine 6,8/5,4 with the thermochemical heat recovery of exhaust gases. According to the materials of experimental research the analysis of the 4-stroke engine 6,8/5,4 with spark ignition and external mixture formation when operating on petrol with additives of syngas. Given the indicator diagram and dependence of effective indicators, when working on a load characteristic with additives of syngas – 2,0…3,3 %. Key words: ICE, utilization, exhaust gases, ethanol, synthesis gas, fuel consumption. 1. Matievskiy D. D, Logvinenko V. V., Kuzmin A. G. Perspektivyi ispolzovaniya porshnevyih DVS v kachestve istochnika teplovoy i elektricheskoy energii dlya energosnabzheniya promyishlennyih ob'ektov. Polzunovskiy vestnik, 2003, no. 1, 2, pp. 4–8. 2. Maslov, V. V. Utilizatsiya teplotyi sudovyih dizeley. Moscow, Transport, 1990, 144 p.
3. Kamkin S. V., Voznitskiy I. V., Bolshakov V. F. [i dr.]. Ekspluatatsiya sudovyih dizelnyih energeticheskih ustanovok: Uchebnik dlya vuzov. Moscow, Transport, 1996, 432 p.
4. Zaharov, G. V. Tehnicheskaya ekspluatatsiya sudovyih dizelnyih ustanovok. Moscow, TransLit, 2009, 256 p.
5. Voznitskiy, I. V. Sovremennyie malooborotnyie dvuhtaktnyie dvigateli. Moscow, Morkniga, 2009, 256 p.
6. Rudnev, V. V. Povyishenie ekonomicheskih i ekologicheskih pokazateley dizel-generatornyih ustanovok utilizatsiey teplotyi otrabotavshih gazov v dvigatele s vnutrennim ob'emnyim smeseobrazovaniem : dis. ... kand. tehn. nauk : 05.04.02. Chelyabinsk, 2007, 123 p.
7. Hripach N. A., Kamenev V. F., Fomin V. M. [i dr.]. Termodinamicheskiy analiz rabochego tsikla dvigatelya s termohimicheskim generirovaniem vodorodnogo topliva. Alternativnaya energetika i ekologiya, 2006, no 4 (36), pp. 45–50. 8. Timoshevskiy B. G., Tkach M. R., Proskurin A. Yu. Effektivnost termohimicheskoy konversii uglevodorodnyih topliv primenyaemyih v DVS. Visnik NUK, 2011, no. 3, pp. 36–42. 9. Nosach, V. G., Shrayber A. A. Povyishenie effektivnosti ispolzovaniya prirodnogo gaza v teploenergetike s pomoschyu termohimicheskoy regeneratsii. Promyishlennaya teplotehnika, 2009, V. 31, no. 3. – pp. 42–50. 10. Kirillov V. A., Kuzin N. A., Kireenkov V. V. [i dr.] Primenenie sintez-gaza v kachestve dobavki k osnovnomu toplivu v transportnyih sredstvah: sostoyanie i perspektivyi. Teoreticheskie osnovyi himicheskoy tehnologii, 2011, no. 2 (45), pp.139–154. 11. Timoshevskiy B. G., Tkach M. R., Mitrofanov O. S., Poznanskiy A. S., Proskurin A. Yu. Eksperimentalne doslidzhennya parametriv porshnevogo DVZ iz sistemoyu termohimichnoyi konversiyi bioetanolu. Dvigateli vnutrennego sgoraniya : Vseukrainskiy nauchno-tehnicheskiy zhurnal, 2011, no. 2, pp. 3–8. 12. Tkach M. R., Timoshevskiy B. G., Mitrofanov A. S., Poznanskiy A. S., Proskurin A. Yu. Harakteristiki eksperimentalnoy sistemyi konversii bioetanola DVS 2Ch 7,2/6. Dvigateli vnutrennego sgoraniya : Vseukrainskiy nauchno-tehnicheskiy zhurnal, 2013, no. 1, pp. 28–32. Abstract: In this article, based on a study analyzes the operation of the 2 cylinder 4-stroke engine 7,2/6 with spark ignition and external mixture formation on gasoline with additives of synthesis gas. Given the indicator diagram when the engine working on a load characteristic with additives of synthesis gas – 25…65%. It has been established that with the amount of synthesis gas added to gasoline in the range 25...65% - the relative heat release rate grow up 7...16%. The feasibility of using synthesis gas additives to gasoline has been economically confirmed. Hourly savings when operating a gasoline engine with synthesis gas additives (25 ... 65%) is 24 ... 48% of the cost of gasoline. Key words: synthesis gas, bioethanol, gasoline, the indicator diagram, the internal combustion engine, additives synthesis gas. 1. Danilov A. M. Alternativnyie topliva: dostoinstva i nedostatki. Problemyi primeneniya / A. M. Danilov, E. F. Kaminskiy, V. A. Havkin // Rossiyskiy himicheskiy zhurnal. – 2003. – T. 47, # 6. – p. 4–11. 2. Vnukova V. N. Alternativne palivo yak osnova resursozberezhennya I ekobezpeki avtotransportu / V. N. Vnukova, M. V. Barun // Energosberezhenie. Energetika. Energoaudit. – 2011. – # 9 (91). – p. 45–55. 3. Shkalova, V. P. Primenenie netraditsionnyih topliv v dizelyah [Tekst] / V. P. Shkalova. – M. : NIAD, 1986. – 85 p.
4. Hripach, N.A. Termodinamicheskiy analiz rabochego tsikla dvigatelya s termohimicheskim generirovaniem vodorodnogo topliva [Tekst] / N.A. Hripach, V.F. Kamenev, V.M. Fomin [i dr.] // Alternativnaya energetika i ekologiya. – 2006. – #4 (36) – p. 45–50. 5. Nosach, V. G. Povyishenie effektivnosti ispolzovaniya prirodnogo gaza v teploenergetike s pomoschyu termohimicheskoy regeneratsii [Tekst] / V. G. Nosach, A. A. Shrayber // Promyishlennaya teplotehnika. – 2009. – T.31, #3 – p. 42–50. 6. Consumer Choice Between Gasoline and Sugarcane Ethanol [elektronniy resurs] // Alberto Salvo, Northwestern University January 2011, Transportation Center. – Rezhim dostupu: http://www.transportation.northwestern.edu/docs/2011/2011.01.20.Salvo_Presentation.pdf. – Data dostupa 15.03.2017. – Nazva z ekranu.